Was just looking through the comments to see if i had to post that it was from Jurassic Park, or if it was already there. so I'm guessing it barfs the 1 cost minion it ate when it dies? when it dies,its mounter gets off and fights. maybe the rider has a mask or something,idk. Really hope it does, never liked the Shade, anyway. 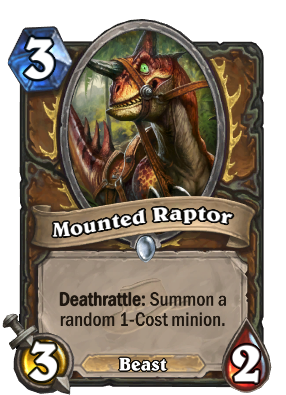 The only reason to hate this card is because it is the reward of a class challenge, which reduces the odds that the brawl will be nothing but Raven Idols. But I have my hopes for a future brawl. Yay!! Finally a Druid card that is low cost and solid!!! I see a lot of play in token Druid decks but not in most ramped Druid and due to its low cost you can just coin and Darnassus Aspirant in first turn then next turn Mounted Raptor or coin it on the second turn. Anyway this card is a randomic Harvest Golem and instead of a mech is a beast and Druid card only. As there are not so many 1-cost cards that are much better than a Damaged Golem the best card you can get from it would be a Injured Kvaldir (as the battlecry is cancelled if summoned by other minion). Great board presence and more aggressive than Harvest Golem this card will be an auto include in most control and token Druid decks. a 3 drop that loses to Mad Scientist, Shielded minibot & Haunted creeper will see minimal play. Then why does a 4 drop that dies to a Knife Juggler or Flame Imp see play in virtually every deck out there? There are a few cards that lose to these cards you cited there like Tuskarr Totemic but it still seem a lot of play because it is a strong board presence as it puts minions on the board and also Piloted Shredder is an auto include in most decks in the current meta but still loses to many 2 drops like Knife Juggler and King's Elek so I don't think that this card will be unusable or will se little play. We wanna see 5 mana Shredder in the next expansion Kappa. Mmmh I think that the game will soon need a redesign on AoEs.. only minions with divine shield or that leave a leftover behind see competitive play nowadays. What's the point of having board clears if everything spawns something else? It is weird but this minion seems really solid, I like it. I think that with new cards beasts gained a lot, so maybe beast druid will be a good choice.